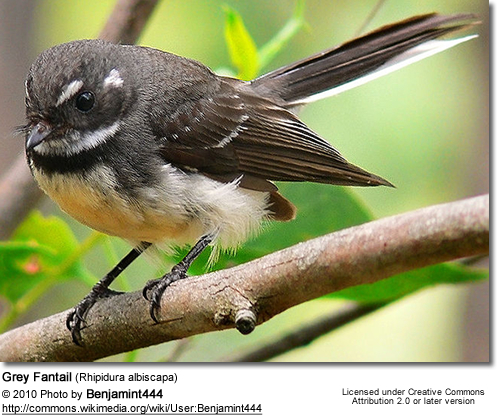 The Grey Fantail (Rhipidura albiscapa) is a small insectivorous bird. 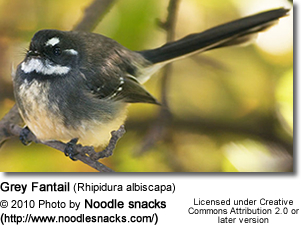 A common fantail found in Australia (except western desert areas), New Guinea, the Solomon Islands, Vanuatu and New Caledonia. 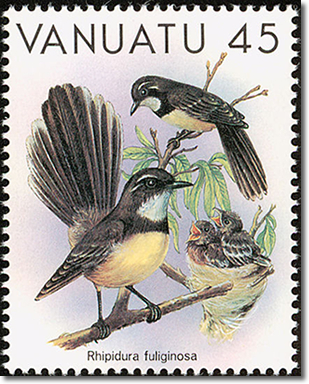 The species was once considered to be the same as the New Zealand Fantail, however due to differences in its calls most authorities now treat it as a separate species. 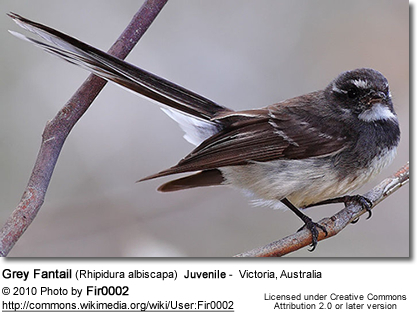 This Fantail is mid to dark grey or grey-brown above, lighter (often yellowish/orange) below, with a white throat, white markings over the eye, and (depending on the race) either white-edged or entirely white outer tail feathers. It grows to 16 centimetres in length, of which half is the tail, which, as the name implies, is often displayed fanned out. This reveals that the outer tail feathers that are light and the centre ones are dark. Some subspecies are found in a darker plumage. During waking hours the bird is almost never still. It flits from perch to perch, sometimes on the ground but mostly on the twigs of a tree or any other convenient object, looking out for flying insects. The birds are not shy, and will often flit within a few metres of people, especially in forested areas and suburban gardens. In doing so, it is able to catch any small flying insects that may have been disturbed by human activities such as walking or digging. The bird's call is an almost metallic "cheek", either as a single sound or (more often) repeated as a chattering. 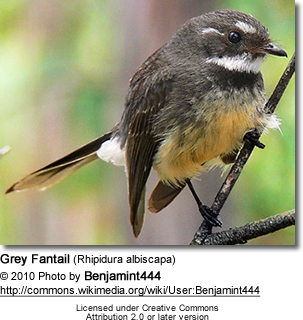 The Grey Fantail is territorial and it is a seasonal breeder. The birds form compact, cup-shaped nests, usually in the forks of trees, made from moss, bark and fibre, and often completed with spider's web. They raise several broods per season, usually each of 3-4 cream eggs spotted grey and brown. Incubation period is around two weeks, and incubation and feeding duties are shared by both adults. Christidis, Les; Boles, Walter (2008). 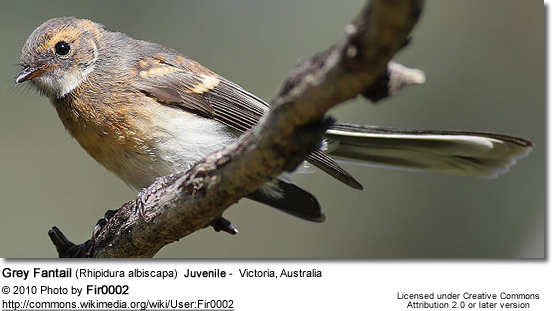 Systematics and taxonomy of Australian Birds. Collingwood, Vic: CSIRO Publishing. pp. 195–196. ISBN 9780643065116.